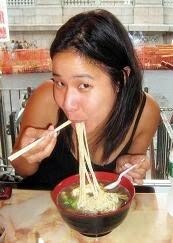 Kissing cousins with noodles, dumplings are another of my all-time favorite things to eat. This week, I decided to tackle not one, not two, but four kinds of dumplings at once. I now have a callus on my hand from four hours with the rolling pin, and a freezer full of wontons, baos, and potstickers. 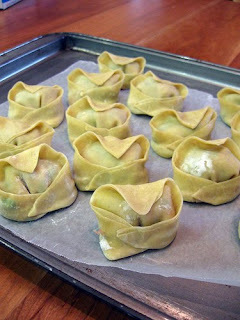 For the wontons, I worked mostly from this wonderful tutorial from Bouchon For 2. I tweaked the filling quite a bit. Though I used only about half a pound of pork (rather than the recommended pound), I found there was plenty of filling for 50 wontons. I decided not to chop the shrimp finely, but rather to cut each piece in half and tuck the large shrimp pieces into my wontons. My first wonton attempt revealed that I could only fit one shrimp piece per wonton. I ran out of shrimp with about 12 wontons to go, so the last dozen wontons were pork only. Writing this whole thing out, I now realize that some first-grade level math would have told me exactly how many shrimp I needed. Correct answer included below. 1. Place all the marinade ingredients in a small bowl and whisk together. Pour mixture into ground pork and incorporate well (I find it easiest to use my hands). Marinate for half an hour, covered, in the fridge. 2. After half an hour, stir in the chives and egg with a spoon or chopstick. 3. Place a wonton wrapper in your hand, oriented like a diamond, not a square. Using a small spoon, scoop a ball of pork mixture and place it in the top half of the wrapper. Take a piece of shrimp and place it on top (see photo). 4. Dip your fingertip in a bowl of water and wet the edge of the bottom half of your wrapper. Bring the top half over and seal firmly. You can leave the wonton as is, or optionally you can bring the two triangle corners together and press together with another dab of water. this seals the dumpling more securely, making it less likely to break apart while cooking. Avoid overfilling. Place wonton on a cookie sheet lined with wax paper. As you're working, keep your completed wontons lightly covered with a piece of plastic wrap to prevent them from drying out. 5. Once you have completed all of your wontons, set aside any that you plan to freeze (see note below). Bring a large pot of water to a boil. Without overcrowding the pot, drop in your wontons. Bring water back to a boil. Once it's boiling again, add a cup of cold water. Bring the water back to a boil. Again add a cup of cold water. Repeat one last time. This process usually takes about 7-9 minutes for me depending on how many wontons I'm making. 6. Serve with a little chili oil and a splash of soy sauce. You can garnish with chopped scallions or grated ginger. Heat up two cups of homemade chicken broth or instant dashi. 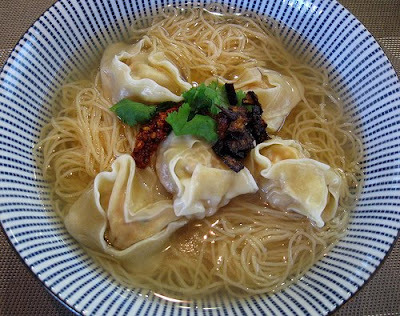 Halfway through step 5 (above), throw in a serving of thin egg noodles (often labeled wonton noodles and available at any Chinese market). At the very last minute, blanch a handful of greens (lettuce, baby bok choy, or spinach) in the boiling water. Drain the pot, place noodles, vegetables and wontons in a large soup bowl and cover with hot broth. Garnish with fried shallots and chili oil. Arrange your wontons so they are not touching and place, uncovered, in your freezer for about 45 minutes (until frozen solid). Do not cover with plastic wrap! Do not do what I did and layer multiple stacks of dumplings on top of each other with wax paper and Saran Wrap in between. This will cause them to go slimy and weird and cause you to possibly lose your sanity as you watch hours of labor nearly go down the drain. Luckily I figured this out in time and spread them throughout every spare surface of my freezer in a probably unhygienic but eventually effective fashion. Next time I'd probably just stack a cookie sheet on top of a baking pan to double my freezing surface area. Once wontons are frozen solid, you can place them in a freezer bag and keep for up to 3 months. When you are ready to cook your frozen wontons, follow step 5 above. You do not need to thaw them first.